It’s here! A new year. A new semester. If you find yourself scrolling through Instagram to a chorus of intentions, reflections, and goal setting and are feeling a little overwhelmed, I’m with you. The new year can be a wonderful chance to grow and harness possibility, to make big goals, and develop new habits. That said, every year I find myself making a list, or picking a few big goals, and forgetting them come February. It can sometimes be daunting to tackle the optimistic new years resolution list. 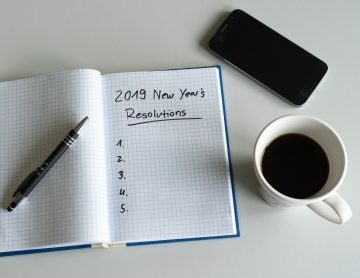 This year, I am working on paying attention to my existing habits and working to alter or improve them in small ways for 2019. That said, I’m not totally swearing off the (somewhat cheesy intention) making that often accompanies a new year. I’ll admit it. I love choosing a word that centres my goals for the year, an intention umbrella if you will. This year, my word is productivity. I’m curious to know, with second semester fast approaching, what word would you choose for 2019? I’ve also been thinking a lot about productivity and habits these past few months. How do we get things done? How do we form more positive habits? I’ve been testing out and experimenting with various apps centered around productivity and habit making and I’m excited to share with you a few of my favourites that I am carrying with me into 2019 with me, cheesy intentions and all. The title of this app is very on the nose but for good reason. If you are looking for an app that helps you keep track of your habits and makes you more productive, this is it. It allows you to plan personal habits daily, weekly, or monthly, and will send you reminders. What I love most about this app is you can look back on the month and see what weeks you stayed on tasks and what weeks you didn’t. The app tracks days that you achieved all your habits/goals in the form of “streaks” which appeals to my competitive side and keeps me motivated. Much like a check list, it is very satisfying to mark “done” when you complete something during the day! Do is essentially a sleek to do list on your phone. It’s a simple, easy to read design and it’s intuitive to figure out. I love using this app in combination with Productive because it lets me be more specific with daily one-time tasks or goals specific to a given week or day. You add a to do task and cross it off when your done. Anything you don’t accomplish that day gets carried over to the next so you don’t forget! Habitshare is another great app that has many of the same features as Productive. And best of all, its completely free! What makes Habitshare unique is that it lets you share your habits with other friends on the app to help keep you accountable and stay motivated. You can control who sees specific goals or if you want to keep your habits private. It’s a great app for anyone who likes someone to hold them accountable to goals or deadlines. Here at the CLC we want to wish everyone a happy new year and welcome back for term 2!